Both in design and design research many of us struggle with how to balance the doing of design experiments with the readings, conversations and sometimes writings that are essential for being reflective practitioners. In the Spring of 2016 Daniel Charny, director of From-Now-On and professor of design at Kingston University was a guest professor at CODE. During his stay with us we set a series of round table conversations exploring design practice, process and product through pertinent themes and participants insights. Taking notes of the sessions on a shared digital space was another layer of exploring collaboration. The conversations resulted (among many other things) in a newspaper-type publication by From Now On and guest ph.d. student Inês Veiga*. 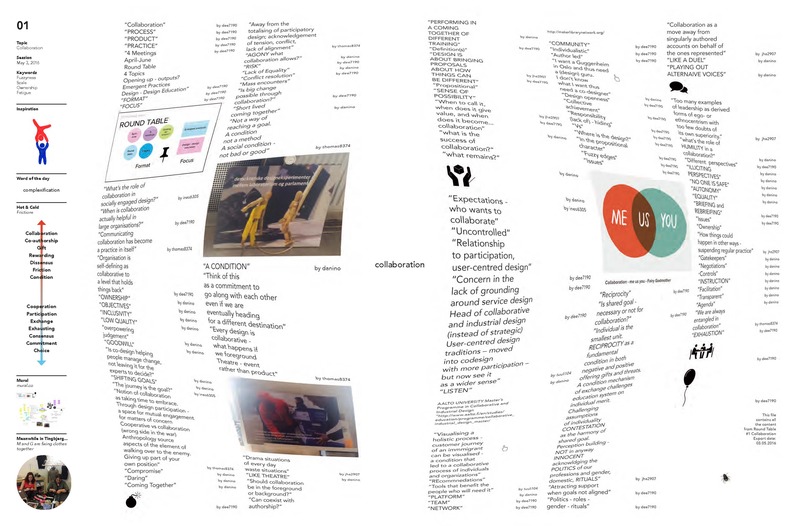 The publication blends Mural notes with quotes and visuals shared by the participants in an attempt to capture traces and conflicts of the conversations on the fly. With this seminar and release of the newspaper we want to celebrate the significance of exploratory conversations though another round of exchanges centred on how we may create and make use of novel formats in the conversations we take part in and the writings we share. The first year students at our codesign master programme will also use the seminar as a first occasion to think about and discuss a publicationon codesign cultures, processes and outcomes that they will write and produce during the spring term. The Round table Conversations newspaper is available on request from us at CODE.